At The Select Group, we foster a “work hard play hard” culture and are always looking for high-performers to join our team of career professionals. Every year, our Talent Acquisition Team travels to universities across the United States and Canada to meet with college students, explain our career opportunities, and identify candidates who have what it takes to join our team. 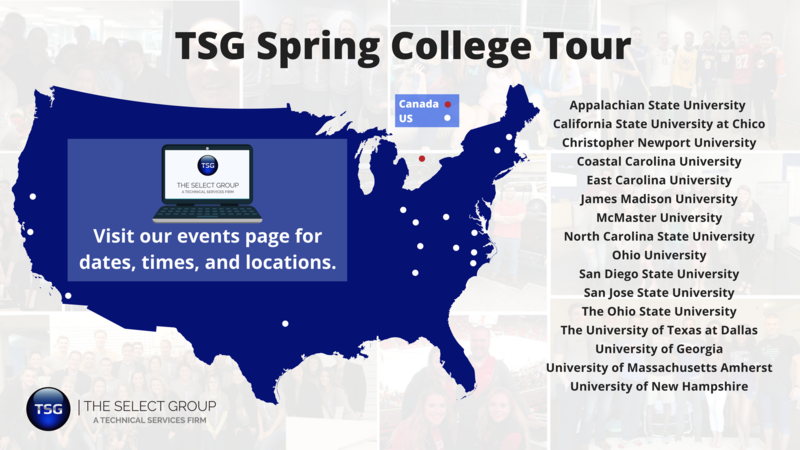 A career with TSG is the opportunity to challenge yourself, to set aspirational goals and work to achieve them, and to impact lives – one positive experience at a time. If you’re interested in kicking off your dream career, check to see if your school is included in the list of college career fairs below. Once you’ve decided to attend one of these career fairs and meet our Talent Acquisition Team, make sure you’re prepared. Check out our LinkedIn Guide to make sure your profile is representing you in the way you want it to. If your school isn’t on the list above, email our Talent Acquisition Team to discuss career opportunities near you. Not gearing up to graduate just yet? No worries. Read our “How to Land the Career You Want After College” blog to see what you can do now to make the post-college job hunt much easier.